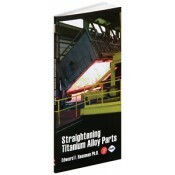 Unlike any other book, this practical and proven guide will provide you with a foundation for determining causes and remedies for warpage in titanium alloy part fabrication. It discusses methods for straightening titanium alloy and describes criterion for selecting the most appropriate straightening process. You’ll never have to fight distortion or throw away warped titanium parts again! • Discusses in detail the causes of warpage of titanium alloy airframe parts. • Provides proven steps that can be taken to prevent warpage. • Offers recipes for straightening titanium parts—straightening in a gas furnace, straightening in an electric furnace, straightening in a vacuum furnace, straightening cold, straightening by shot peening, straightening using blacksmithing techniques.